The kid behind you is kicking your seat, the woman ahead of you is wearing flowery perfume, and the man across the aisle has had a few too many cocktails. Ladies and gentlemen, welcome to air travel: the transportation option most likely to make you grumpy. According to a 2015 report by the American Customer Satisfaction Index, airlines are among the lowest-rated industries when it come to customer satisfaction. We surveyed 1,097 air travelers to determine which offenses they find most aggravating. 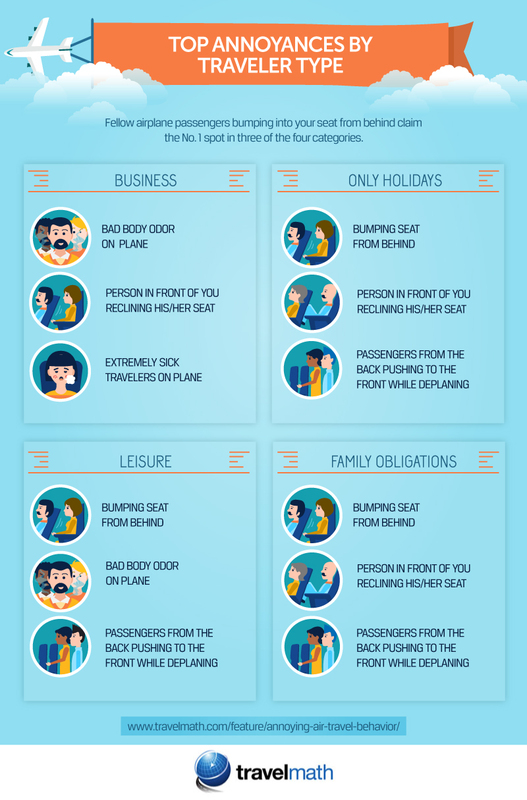 Take a look at the results: Are you a victim of annoying air travel behavior – or a violator? When it comes to behavior on the plane, unsurprisingly, the top three annoying behaviors involve the invasion of personal space: sitting in a seat that’s being kicked, smelling a fellow passenger’s body odor, and sitting behind someone who reclines the seat too far. After all, there’s no way to escape these annoyances when you’re 30,000 feet in the air. But according to the survey, even more travelers are annoyed by obnoxious behavior in the airport. The top pet peeves mainly involve noise and chaos – no fun for weary travelers who just want to get to their destination. Loud music is the biggest offender, followed by kids running wild and fellow travelers who have too much to drink at the airport bar. Unfortunately for passengers, some of the most obnoxious inflight behavior is also the most prevalent: Passengers report frequently witnessing kicking seats and reclining too far. But the pet peeve they most often notice is a refusal to share the armrest. How does gender factor in? It turns out that both men and women are equally prone to irritability during air travel. Exactly half of male and female travelers report noticing a behavior they perceived as “extremely annoying.” However, men and women feel differently about various behaviors. For instance, women report being much more affected by strong perfume than men. They’re also more bothered by what might be perceived as selfish or thoughtless behavior: phone and computer users who monopolize power outlets, brusque flight attendants, fellow travelers who leave luggage on airport seating, and passengers who bring smelly food on the plane. Men seem to be more disgusted by certain smells, including body odor and sock feet on airplanes. Male passengers also have less patience for people who stand still on the moving sidewalk, flight attendants who crack corny jokes, children behaving badly, and travelers who play music or games loudly. Passengers’ top pet peeves can differ based on their reason for traveling: People flying on a business trip are slightly more tolerant of having their seat bumped from behind than those heading to vacation – possibly because frequent-flying business travelers are more accustomed to that inconvenience. Business travelers are also most bothered by sick passengers – after all, coming down with a cold before an out-of-town conference or client meeting would be a pain. Vacationers are more concerned with enjoying their journey and tend to lack patience when it comes to annoyances. Both business and leisure flyers are more sensitive to offensive body odor than travelers en route for family obligations or holiday getaways – perhaps traveling with the family affords passengers more tolerance for off-putting smells. Each type of traveler departs with a unique mindset, which can affect their feelings toward poor airline etiquette. The next time you’re traveling on an airplane, you may roll your eyes at the behaviors we examined here. But look no further than the news headlines to realize that it can always, always be worse: Consider the male passenger who recently urinated on travelers while aboard a plane headed to Portland. And the female traveler headed to Indianapolis who recently became unruly and grabbed a flight attendant, kissed her, and then punched her in the face. Now there’s an entire Facebook page dedicated to “passenger shaming” – outing travelers who exhibit unacceptable behavior on planes. But it’s not all bad news: According to a new J.D. Power and Associates study, passenger satisfaction of North American airlines is actually on the uptick. As airlines strive to provide a good experience, sometimes all a passenger can do is hope for the best on a particular flight: that means seatmates who share the armrest, liberally apply antiperspirant, and keep their shoes on. We surveyed 1,097 air travelers in America to find out which behaviors on planes and in airports were being witnessed most and which behaviors are most annoying. Feel free to share the images found on this page freely. When doing so, we ask that you please attribute the authors of this project by providing your readers with a link back to this page. This will allow readers to learn more about the research and methodology behind the project.